Set up the paper bulls eye targets. Set up the paper silhouettes. Then set up some steel targets for improved handgun training. Steel targets that can be purchased for a moderate price, will last indefinitely, and will provide feedback second to none when shooting. Millions of handgun owners across America go out monthly to shoot, thinking they're getting prepared to defend themselves. Nothing wrong with standing and shooting a gun to get used to it and test its effective range. But if that is the only type self training you ever do, that's all you'll be prepared for. Standing still, facing your target in the open, shooting from a fixed stance. Is that likely to be a scenario that will allow you to automatically defend yourself if you have to use your firearm? Time to add more targets, strategic placement, and side to side, as well as forward movement in your practice. 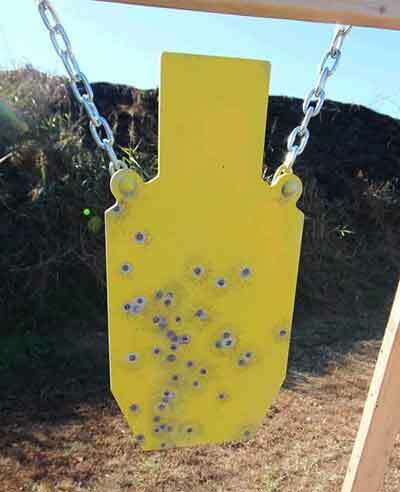 Adding steel targets to the mix to improve your handgun shooting is something that will improve the enjoyment, enthusiasm, target feedback, and movement training. You can get silhouettes like the one above, or gongs of any size like below where I get mine at Shooting Targets 7. All shapes, sizes, and mounting hardware. Everything you need for a steel target setup is available. When ordering any steel target, consider the type shooting you'll be doing, caliber, distance, etc., to determine the correct thickness for your needs. All info about what is needed is included on the website. 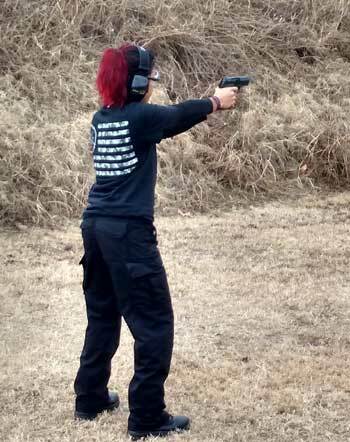 Time to add movement to your strategic handgun training. Below is a video that is just one setup within a pistol bay boundaries at our gun club. We are able to set up wood/paper targets, balloons, steel, and more. The video shows me using all the available targets to train moving with my gun(s). A second video below shows my daughter and me with a different setup in a short POV clip. You can see the difference between just shooting bulls eyes and moving, shooting, covering, shooting again. In this video from the day we hit the range, we were limited to a short distance bay. We had to improvise, but the steel could still be heard ringing. It's the steel targets that make the day when training. The challenge, feedback, and pure enjoyment factor just can't be beat. Setting up multiple target points to strategically challenge your shooting skills and methods is not hard. If you can find a shooting area with enough length between where you start and where the bullets land, you can set up some pretty valuable range practice stations. Moving quickly from target to target, using some stands to take "cover" while shooting the ones behind them. All you have to do is use your imagination as to how you want to practice and what you need to work on. When setting up steel targets, if you have the length of area to do so, set it up further from other targets since there will be some necessity to keep specific distances from them when firing. If, like in the second video above, you don't have the depth of space to set the steel targets back, be sure to use discretion in the distance you shoot them from before approaching the other targets. Other than that, it's game on with the steel. Move, walking or running, from target to target shooting one handed, two handed, in the open, using target stands as cover. Just about any scenario you can imagine can be set up. And the steel will give you rewarding feedback that just can't be replaced with anything else. I used to think steel targets were out of bounds for me in terms of cost, places to set up, safety, etc. Turns out I and anybody who shoots can get these great handgun training assets for modest prices. They last seemingly forever. They can be painted. They are among the most satisfying targets to hit with their feedback. A little money. A lot of value for steel targets. And setting up steel targets is again, a product of your imagination. There are people who own their own property who make elaborate setups to hang them. But, if you use a gun club or some type of restricted area the saw horse brackets you see in the pictures and videos work perfectly. Portable, easy to set up. Stable. Easy to adjust and prop up on uneven surfaces. The fact is, if you want to increase you handgun shooting and training, there is no better path to take than getting and working out the addition of steel targets. 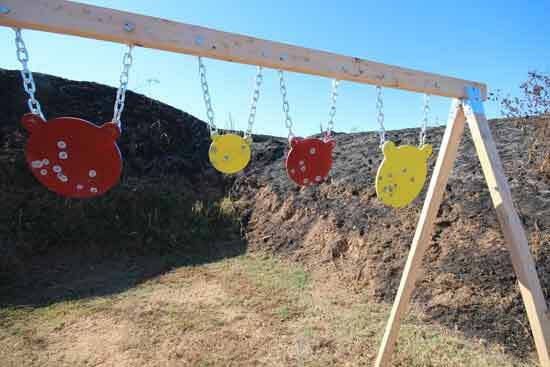 Steel targets that will definitely help you improve your tactical, defensive, handgun skills.